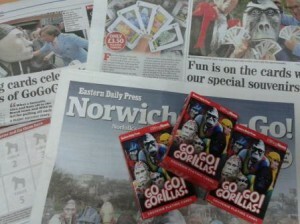 Home - Playing cards to raise the GoGoGorillas game! Playing cards to raise the GoGoGorillas game! With the Great British Summer this year has come the GoGoGorillas trail, which has caught the imagination and attention of visitors and locals alike. The gorillas have been a great attraction in Norwich and so that we don’t forget them after they leave the streets on the 7th September, a set of playing cards has been produced with the front of the cards each showing one of the 54 gorillas. You still have time to see get out on the trail and for more information on where you can obtain both the GoGo Gorillas maps, details of the charities involved and the planned auction on the 3rd October please click here. If you have been out of luck in getting your own pack of these amazing cards we have two packs to give away. All you have to do is ‘Like’ our Facebook page and email us where Mr Carrow is located in Norwich, to [email protected] along with your full name, address and postcode. The competition closes at midnight on Thursday, so be quick! Winners will be announced Friday morning.